As you get older, you will probably find that more and more of your friends are falling in love with each other and tying the knot. Despite this being a practice that human beings have done for thousands of years, the newlyweds in your life will quite possibly act annoyingly smug and proud about their nuptials, but — God bless 'em — you love them anyway and maybe, just maybe, you want to get them something nice for the holidays. Need help knowing what to buy? Here it is — your holiday gift guide for the smug (and not-so-smug!) married folk in your life. When we put out a call for the best couples gifts, the most common answer you came up with was a simple one: Booze. Sure enough, if there was ever a nice thing for a couple to enjoy, it's a good bottle of something, however, I'll leave what that something is up to you. Instead, here are some beautiful drinking accoutrements perfect for your favorite married drunks. First, who wouldn't want to cheers with these darling Mr. and Mrs. cocktail glasses ($18) from Furbish? Shake it up: Gold Cobbler Shaker, $75, Umami. Personalized decorative ice buckets, iomoi. Perfect for a cold night in! A.F. Rapoport Hot Buttered Rum Batter, $8 for 8 oz., A.F. Rapoport, Ltd. Speaking of a night in, reader LaComtesse recommended putting together a stay-at-home date kit with movies, popcorn and hot chocolate. Why not include some DVDs from your favorite television series? A DVD box set is the stay-at-home gift that keeps on giving. The Wire: The Complete Series, $84.96, at Amazon. Friday Night Lights: The Complete Series, $53.99, at Amazon. Girls: The Complete First Season, $22.99, at Amazon. No stay-at-home date night is complete without a nice blanket to snuggle under. These ones from Pendleton are stylish, cozy and high quality ($138). Perfect (and cruelty free!) for their mantle. Giant Cardboard Taxidermy, $52, at Urban Outfitters. Couples, just like normal people, have interests that — le shock! — you can use to inform your gift. If they happen to be into cycling, why not buy them a guide to biking the country alongside some tubes for their bike tires? If they're more into trips in the car, swap out the bike guide for a book on your area's strangest attractions and accompany it with a gas card to fuel their journey. Basic Essentials Bicycle Touring, $8.95, at Amazon. Novara Schrader Tube, $7, at REI. If your friends are big campers, a double sleeping bag is a must! REI Siesta +35 Double Sleeping Bag, $119.33, at REI. Do your married friends love to cook? Reader Penny suggests some potted herbs. Maybe this windowsill herb garden ($37.95) is the perfect choice? Reader maneki is a self proclaimed "unsmug married" and what she wants is an at-home ice cream maker. This is a gift we can all enjoy. Cuisinart ICE-21 Ice Cream Maker, $59.99, at Macy's. When in doubt, a magazine subscription makes a great household gift. Not only are they generally affordable, but they last for a whole year. 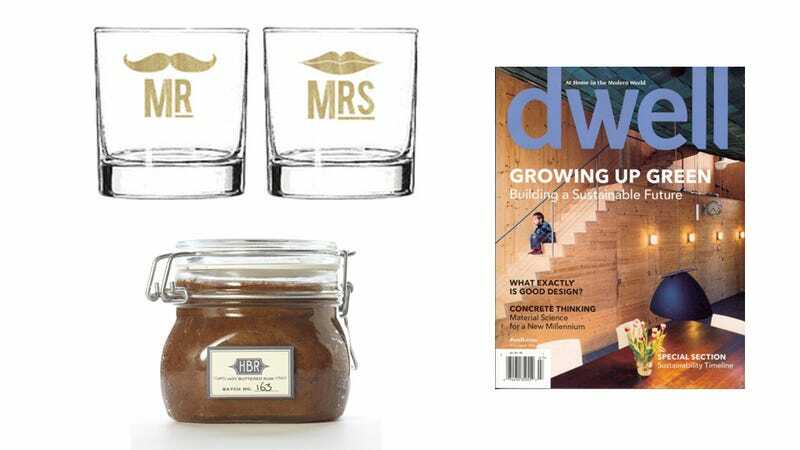 One-year subscription to Dwell, $19.95 for 10 issues.